This is just the super cutest Sherrie! Love this design and the great embossing on the waves! Sorry I haven't been around much, the kids start school on Monday! I am scrambling to get everything ready while being at work! Check out my blog tomorrow, I have a special limited edition Skittle release coming out! Thanks for joining us over at the DoubleClick Skittles Challenge! DT Member Carri~Abusybee Skittles! This is just ADORABLE! LOVING that whale and the waves!!!! What a fun treat box. Your little neighbor boy is going to enjoy it, especially since no one else is going to have one like it!. 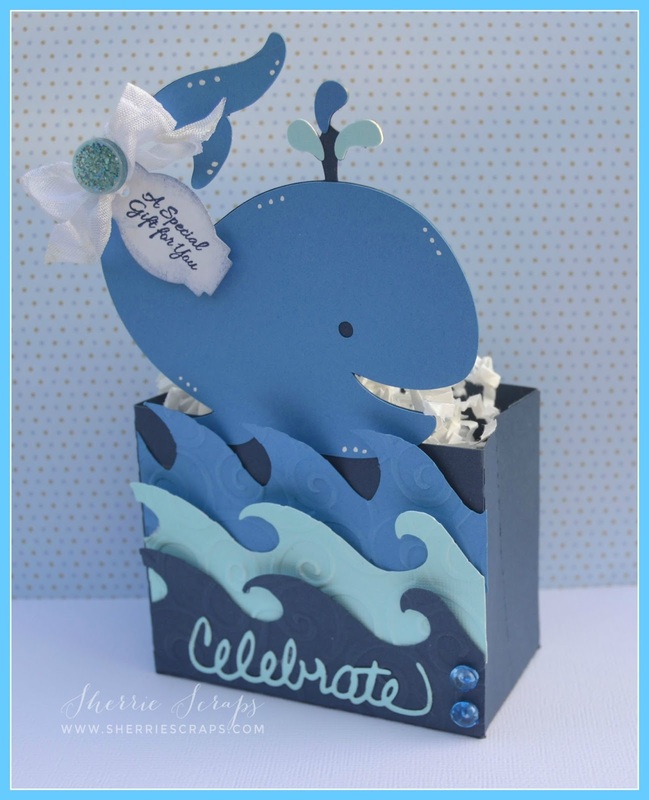 So cute Sherrie,embossing the waves really make them pop! Oh my gosh, so absolutely adorable, Sherrie!! I love the whale!! How cute that he has a little water spout, too!! Embossing the waves was a perfect touch!! I just love this!! I need to see if there is a similar file for Cricut!! I hope Arya is feeling much better. There is nothing worse than the stomach flu...unless it's the stomach flu in the summer, taking away from play time. Ugh. Hopefully no one else in your family got it. I'm pretty sure the tornado that went through your craft room picked up steam and hit mine head on!! Seriously, it's to the point I've had to forge a trail to my desk and then try to shove supplies out of the way to craft!! I need like a day to get it in order. What a super cute treat box!! Love it!! Have a great day. I love treat boxes and you have done such a wonderful job on this. 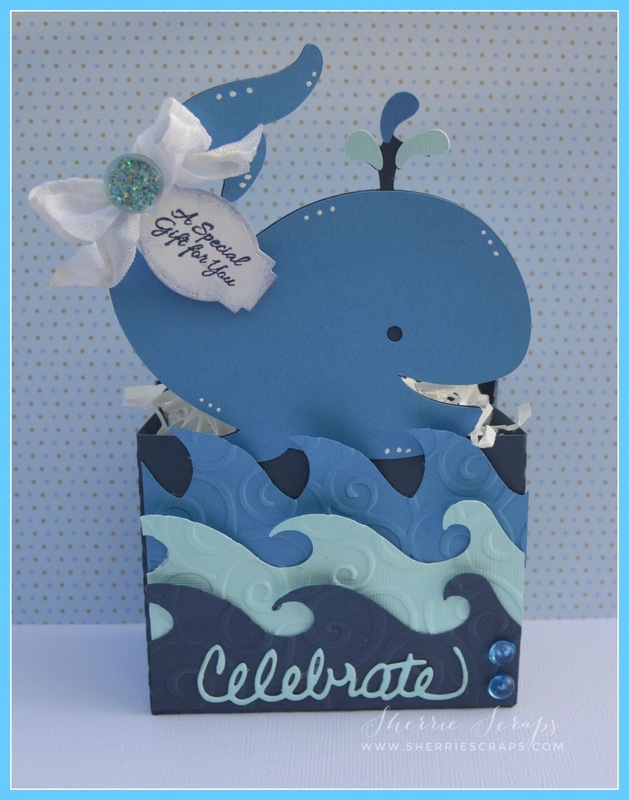 Such a fun, whale of a card/box! Anyone would love to be the recipient! Thanks for joining the DoubleClick Skittles challenge. I adore this little box! I just got a super cute whale stamp set and you gave me inspiration. I always use the divine swirls on my waves as well. Stacking the waves how you did on the front really added some wonderful dimension to your project! Thanks for playing at Jo's Scrap Shack! Your treat box is adorable! Love the sweet whale and the embossed waves! The entire design is just gorgeous! Glad you were able to sneak in some crafty time! Oh wow this is super cute Sherrie!! That treat box is really cute and perfect for a little boy! I love your embossed waves and how you created them is different hues of blue. :) The little sentiment is just perfect and fits perfect on that cute little tag! Perfect gift! Thanks for joining us this week in our Funday Friday challenge! Have a wonderful day! This is absolutely adorable Sherrie, love the embossing!! FUNNEST, CUTEST, SWEETEST gift box EVER!!! Love it - I "WHALE"y do!!! So very glad you joined us for the From the Ocean Challenge over at DoubleClick!! We are so glad you linked up with us!! Hope to see you again soon!!! So super cute....what a special gift box, love the theme! Oh I LOVE this darling treat box! I really need to get the Cameo out and play! I love the ribbon and tag and the waves are fun in graduated colors. This is really cute! The whale is so much fun and I love the different shades of blue you used for the waves. The embossing and embellishments add that perfect finishing touch - super cute! Me again! Had to come and peek at your whale one ore time. It is super fun! Thank you for joining our “Anything Goes with Ribbon” Challenge this month at 3 Girl JAM. This is super cute!!! I love how you tied the ribbon around the tail. Thank you for joining us at 3 Girl JAM! Oh I lOVE this treat! I saw it over on facebook and just fell in love! Such pretty colors and a great design! Oh how cute!!! Wow, just adorable! thank you for joining us at 3 Girl Jam this month! Totally cute & fun!! I love the cute whale! Fun treat!! Great job!! Love how you combined all the challenges and how you used the sentiment from the Sip, Enjoy and Relax Pretty Cute Stamps set! Thanks so much for joining us for the Pretty Cute Stamps Birthday challenge this month and hope to see you again soon! Oh my goodness I'm sure your neighbor just loved this!!! Super cute and I love the dimension. Thank you for joining us @ Pretty Cute Stamps! 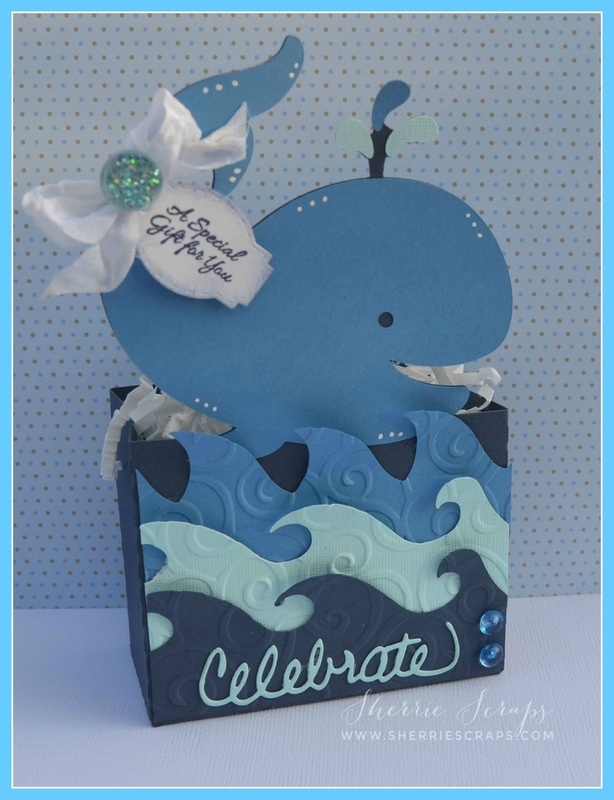 The blue and whale are perfect for summer bdays! Thanks so much for joining the Pretty Cute Stamps' Birthday Challenge this month!! Oh Sherrie ~ this is so ADORABLE and so FUN! LOVE the spout of water coming out too! Seriously so many details! I bet the birthday boy LOVED it! Okay I missed one of your sweet little ladies was sick ~ UGH! Not ever but especially in the summer time~ wait winter might be worse because it spreads faster! Either way I hope she is feeling better!